How do I clear the render border? In the 3d viewport I am using a border region to only render things inside the selected region. I did this with CtrlB. I cannot get rid of the region. How can I make the border disappear? 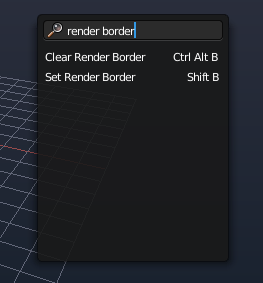 Use Ctrl + Alt + B to clear the render border, or if you open the Space menu and type "render border", you should see the option. There is also Shift + B, but this is the legacy shortcut for border render IIRC and it only works when looking through the camera. Use Ctrl + B as you can have different render borders for the viewport (when doing realtime rendering) and the camera. 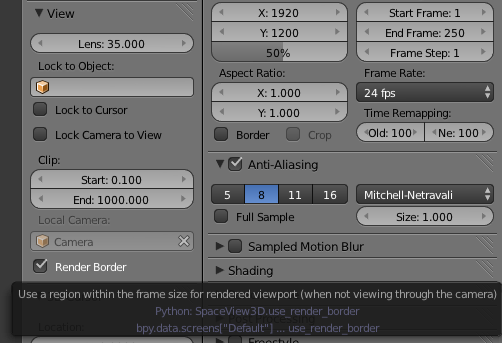 On the View Properties Panel (N to open it) you can find the "Render Border" checkbox. So, select/unselect the chebkbox to enable/disable the render border appearance. There is also a "border checkbox" in "Properties > Render > Dimensions panel", SteveW posted an image of the panel in this post. Not the answer you're looking for? Browse other questions tagged rendering 3d-view or ask your own question. How do I get rid of this orange selection box? Render Border's related check boxes - How do they work? Separate preview/render border settings possible? Luxrender - How to select API 2.x? How do I create a precise, tight fitting render border around an object? Can 3DView Border Select behavior be changed?